SE215, In-ear or ear-Pad monitor from Shure in the SE Models series. I am usually not a big fan of in ear monitors but I was in need of a pair for a single situation that I was in on the road so I decided to just purchase these from a locals music store that I have never heard of . The guy that worked there told me they where great and I wouldn’t be upset with my purchase but because this wasn’t a major chain store and I already ton like in ear monitors I was very skeptical. But he talked me into buying them with the guarantee that I could bring them back if I was unhappy. So I purchased them and lets just say I have used them more than expected over the last year and a half. This are great in ear headphones and I was so impressed with the quality of them. I wish I knew about these when they first came out and I would have bought them right away. You will be able to hear all of your low tones with them with no problem. Which is part of the problem I don’t in ear monitors because I feel like all I can ever hear is highs. But I can hear all the low tone instruments in the Shure SE215’s very clean and clear without it being muddy. Also normally in these type of headphones the highs are just too much for me and give me a headache but these didn’t. There is a very well balanced sound in these in ear monitors. I have been using for a while and find my self using them more and more since I have had them. They are very well built to be so small, they come in standard black like the picture above or a clear pair which I have. The clear pair look a little better to me for style but either way they will sound great. theaudioandvideoguy's review"Shure created some great in ear phones"
The Shure SE 215 in ear headphones will sit right in your ear very comfortably and give you a great musical experience. I love these, I am usually not a fan of “in ear” headphones because they just aren’t very comfortable to me and they usual sound like your listening to music on a old radio. Meaning they usually have a very dull high frequency sound. These really are not like they, they give off just enough bass that you can really get your head bobbing to the music and feel it. The high’s are not over doing it either, they put off a very clean sound, I am really impressed by Shure with these headphones , these are actually one of the first pair of in ear headphones I have used from Shure. I had no idea Shure made these type of headphones. On the best things about these headphones is that you can detached the cord from the actual headphone. I have seen this on hundereds of normal headphones but on an in ear headphone? I have never seen that and I though it was pretty cool and innovative. If there is every an issue, mainly a short in your wires you can easily replace them and not have to purchase a whole new set of headphones. Not that you would have to replace them, because they seem to last a long time. You can also, get them in different sizes as well, which is a good thing but odd to me. Most in ear headphones are mainly one size fits all. So by Shure doing this shows that they are truly thinking about the customer because they would have to have all these different sizes that not that many people might not buy. So they have a little more overhead in that department. But overall, great in ear headphones. Plug these up to your iPod and you wont need anything else, you can wrap these up and put em your pocket and have no worries. Very durable and long lasting. yoTrakkz's review"cheap but nice sounding"
I really wasn't expecting a $99.00 pair of earphones to have superb sound but the sound quality of the SE215's really impressed me. They come VERY close to my $250.00 dual driver earphones of another maker. They do take a bit of finesse to find that 'sweet spot' in my ears but once I picked the correct size tip and found the right spot, the frequency range was excellent. Smooth response from low-end (not overly punchy or distorted) all the way to the high-end (not harsh). Very comfortable plus they sit flush with my head, unlike my other in-ears. For the price, I would highly recommend them! babas3d's review (This content has been automatically translated from French)" Pleasantly surprised"
I tested a lot of low-end headphones and monitor headphones. They do not have as much bass as my DT770 but it's fine for a price 50% lower, urban use and a smaller footprint. The quality / price is very good nine to 73 € shipping included in relay point with Materiel.net. A € 100 in most other brands it's still not bad but less . If I lost mine, I would buy direct. I use the metro and RER with music rather rock-metal. This is my first in-ear, I find them very comfortable with moss ball style quies. So you have a little crush them before placing them in the ear and wait for them to call into shape for optimal listening. The cable is fine, its ample length and it is a little stiffer than anything I had that which prevents kinking when the ranks too hard in his bag. They are not necessarily easy to put on but once in place, they hold very well. No discomfort or heated ears after an hour of listening as the sound is well balanced and defined no headache either. The original foam tips installed by default on the headphones fit my ears. One of them is a little damaged / crushed on one side because of the prolonged storage in the box. 3 sizes of ear tips quies and plastic foam are supplied either 6 pairs of tips. I find the sound very good for the use I made. We're pretty well insulated from the outside. Without music I have the impression that the subway is a very calm and quiet and we hardly hear the trains into the station. The noise level is very good and thanks to the insulation, no need to put the phone to the bottom to listen to my music. I tested thoroughly, between songs he does a kind of decompression inside the ear which is not very pleasant. In fact I think it means a little but two thirds of this level is strong enough to be a good listener without disturbing others. blancjs's review (This content has been automatically translated from French)" Very well again!" Used for a few weeks, this is a excelent product with a small preamp has the belt. Paufinez balance on your console and it's great to repeat! It takes very very good in the ear with his pre cordon that goes around perfectly. The small room which serves to tighten the 2 cords behind the head is great, it greatly contributes to maintaining good headphones, perfect! Tested for a repeat of 4:00 and no ear fatigue. Cable Length plenty sufficient, especially with a preamp has the belt. All seems sturdy and easy to find spare parts in any music store that distributes SHURE is very reassuring. The insulation is perfect, I hear almost my battery without necessarily paying much attention to the sound level I play! I'll be obliged if wanted to transplant at least the bass drum and snare, overhead view of the position for the next repeat, so I do not get to play with! The noise level (in repeats, because I have not tested live) is very ample with a preamp from Fisher amp (body pack). I play a third level is what is more than enough to keep my cabbage leaves. I do not understand my time critical repprochant his lack of serious .... just do a proper balance to the table! This is probably not comparable with modèls 1000 € but 60 € secondhand is TOP! Lumiere man's review (This content has been automatically translated from French)" Good ears at the right price!" I am a keyboard player! I was looking for a solution to overcome the problem back foot bath + earplugs so I left a return configuration ears for quality and easy to get along! The choice is however difficult given the amount of product offered but I was pushed informed Shure quality! I use it about a week ago but enough to appreciate its quality! I tried several before that particular model from Sennheiser, but I was finally repatriated to the Shure se215 that was the best in this product line! -Most importantly, great sound quality with a good response in the treble! 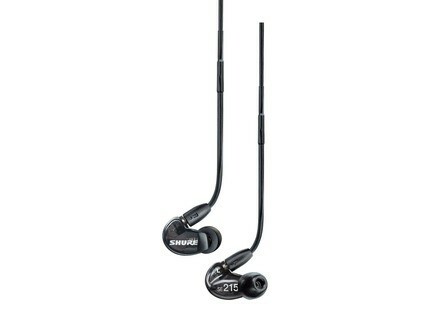 As mentioned in the title Shure has ears offer inexpensive (compared to other products on the market!) But with great quality! A product that is suitable for those who want to discover the ears without falling into ruin .... useless while enjoying a professional and a great way to find the grain of his favorite instruments on stage or repeating! Armageddon's review (This content has been automatically translated from French)" Excellent but ..."
I use them for 1 month in rehearsal with my band (I am a drummer). This is the first time I try monitors "in ear" and I appreciate the level of definition and precision found in relation to listening live. The ergonomics are excellent, it fits in place, it made me look as made to last. The cable is detachable headsets. I learned it was an evolution created by Shure to circumvent problems of previous lines or cable was molded into the headset: when the cable broke, the headset became unusable and had to replace everything. Now with this solution, if the cable undergoes a problem, it guards the atria and buy a new cable (cons by Shure). The fact that the cable connector into the headset turns on itself is also a great idea: no twists or "fangs". To complete this famous cable has, just after the atrium, some slightly stiff who can hang around the ear and left in place. The SE215 as the range also comes with several tips of different size and material to suit the tastes and ear canals of each. There are 3 sizes closer to the wider and 2 materials: foam and latex. The soundproofing is extremely effective. Ambient noise and even my battery as I violently beat up right under my nose does not go too wrong. It can therefore be well to concentrate on the mix sent in the ears. This also has the advantage of reducing the noise level as would hearing protection, and that while keeping an accurate listening. So far I played with ear plugs. These primarily block the high frequencies while reducing the sound. It had the advantage of protecting myself, but then we play without some of the sound spectrum, with a sound somewhat muffled. Thanks to the monitors of this type, we protect ourselves from dangerous amounts of heavy metal while hearing well (for everything that can be transplanted well and well mixed). The sound of the SE215 is pretty good. Tested on an MP3 player that is very correct. on the other hand, repeating or live situation is a bit tight. Indeed, these headsets are critically short of capacity has to produce low frequencies. Besides, starting from a certain volume (say powerful without being too high) while the low saturate and it becomes disgusting. If you push a little big is the distortion! Yuck. I find myself down a bass EQ for bass and my drums to have good sound and loud enough. In the end we play with sound too shrill. Too bad! The price is honest and can draw (like me) who want to test the return in the ears at an affordable price. If I had to redo the choise I will immediately have a higher end model like the SE425 or SE535 which reproduce better bass apparently (not tested yet). Otherwise I will stay well on this product range of Shure SE as very thoughtful and very well done. I recommend the SE215 cons by bassists and drummers who will cry for not having their serious and quickly find themselves in a situation sound even worse that the game (when we play poorly understood badly, even if one intends to others).